Friday, 14 September 2018, 12:53p.m. 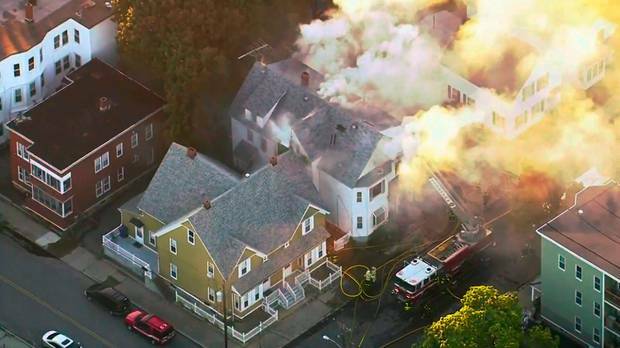 A series of gas explosions left at least four people injured and ignited fires in at least 39 homes in three communities north of Boston on Thursday, forcing entire neighborhoods to evacuate as crews scrambled to fight fires and turn off gas and electric lines to prevent further damage. Massachusetts State Police urged all residents with homes serviced by Columbia Gas in Lawrence, Andover and North Andover to evacuate Thursday afternoon, snarling traffic and causing widespread confusion as residents and local officials struggled to understand what was happening. A man whose neighborhood was among dozens that erupted in fire says he ran into his basement to find that the room was glowing. Lawrence resident Ra Nam says he was in his yard when the smoke detector in his basement went off. When he ran downstairs and saw the boiler on fire, he quickly grabbed a fire extinguisher and put it out. Minutes later, Nam said he heard a loud boom from his neighbor's house and the ground shook. Nam said a woman and two kids had made it out of the house but the basement was on fire. Lawrence resident Bruce Razin was among the evacuees standing outside the Colonial Heights neighborhood near the city's high school trying to decide what to do next late Thursday. Officials had cut power in the area and the streets were pitch black, save for emergency vehicle lights. Razin said he arrived just as residents were being evacuated, and immediately saw the house two doors down was leveled from an explosion. "I couldn't imagine if that was my house," said Razin, who purchased his home nearly two years ago. "It's total destruction. I'd be completely devastated." With a backpack filled with personal items he had hastily grabbed, he said he'd head to his mother's home a few towns over for the night. Lawrence General Hospital said it was treating four victims with injuries related to the fires but did not provide details about their conditions. 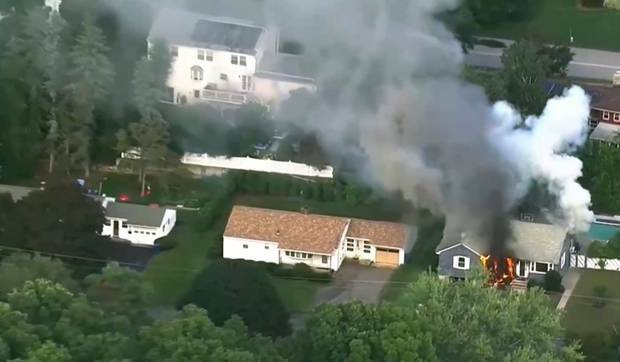 The Massachusetts Emergency Management Agency blamed the fires on gas lines that had become over-pressurized, but officials who responded to the area were still investigating the cause. State officials said Columbia Gas was working to ease pressure on gas lines following the fires. Columbia had announced earlier Thursday that it would be upgrading gas lines in neighborhoods across the state, including the area where the explosions happened. It was not clear whether work was happening there Thursday, and a spokeswoman did not immediately return calls. Reached by phone, some local officials described scenes of panic as residents rushed to evacuate, many wondering if their homes would be next to erupt in flames. In North Andover, town selectman Phil Decologero said his entire neighborhood had gathered in the street, afraid to enter their homes. Just a few streets down, he said, homes were burning. "It's definitely a scary situation at the moment," he said. "It's pretty severe." Arial footage of the area showed some homes that appeared to be torn apart by blasts. At one, the upper portion of a brick chimney crushed an SUV parked in the driveway. Schools and senior citizen centers were being opened as gathering points for residents who fled their homes. Lawrence City Councilor Marc Laplante said entire neighborhoods were being evacuated in the Colonial Heights area, which he represents. "People need to get out of this area safely," he said at the time. "It's really difficult because the traffic right now is horrendous." Joseph Solomon, the police chief in nearby Methuen, said 20 to 25 homes were on fire in Lawrence when he responded to help. He said there are so many fires "you can't even see the sky." 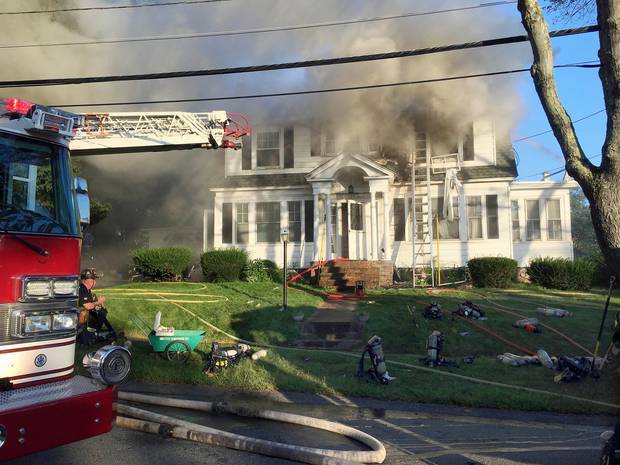 Soon after 7 p.m (local time), officials in Andover said all fires in the town had been extinguished. Around the same time, State Police said electricity was being shut off for all residents in Lawrence, North Andover and Andover, where some were still reporting an odor tied to natural gas. The three communities house more than 146,000 residents about 26 miles (40 kilometers) north of Boston, near the New Hampshire border. Lawrence, the largest of them, is a majority Latino city with a population of about 80,000.